Students will look at and discuss a variety of artistic representations of the night sky, and compare the artworks to scientific representations of the constellations and stars; and paint their own representation of the night sky. 1. Draw a star and explain what it looks like, compare common representations of 5 & 6 point stars. 3. Study real stars in photos from observatories and satellites. 4. Create a painting of the night sky, incorporating ideas from the art & science studied. 5. Write an Artist Statement about their work. Students will actively engage in the processes that constitute creation and performance in the arts and participate in various roles in the arts. Students will respond critically to a variety of works in the arts, connecting the individual to other works and to respond to other aspects of human endeavor and thought. Students will develop and understanding of the personal and cultural force that shape artistic communication and how the arts in turn shape the diverse cultures of past and present society. 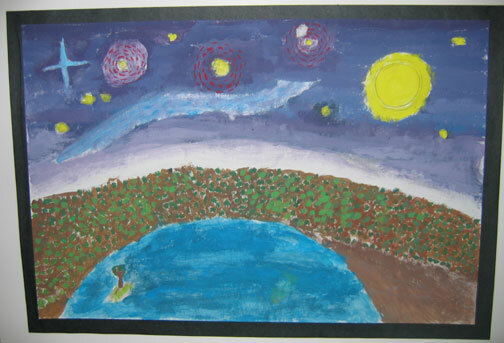 Standard 1: Create a painting of a night sky using tempera paint. Standard 2: Compare and contrast a variety of artworks about the night sky as inspiration, and use the computer lab to research the science of the night sky. 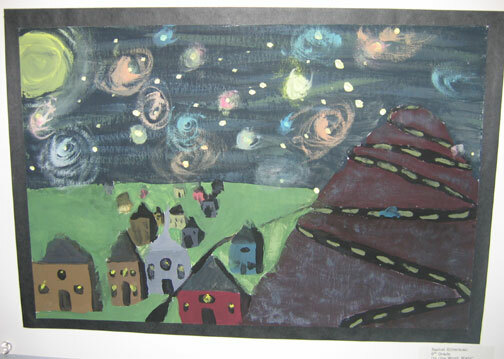 Standard 3: Compare and contrast a variety of artworks about the night sky; write an Artist Statement about the art created. Standard 4: By using art & science as inspiration, make the connection that artists have always used each other and the night sky in their art. 3. Intro to the painting. 3. Color Wheels and value charts Xeroxed onto stock paper. 4. Tempera Paint , Brushes , water dishes, Mixing Trays , heavy Drawing Paper (Tag board or ), Drawing Pencils . 1. Do Now On paper provided, draw a star. Share drawings, discuss similarities and differences. Why do they draw it they way they did? Where have they seen stars like these? 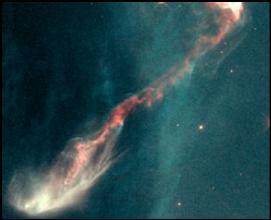 Is this what stars really look like from earth? Why do people draw them with points at the edges instead of spheres? Why does that happen? Has anyone ever see a star twinkle? 2. Explain that stars are actually spheres of gas, and appear to have rays or points because we are looking at them from a great distance, through the filtering of the atmosphere. 3. Look at and discuss the Night Sky Art using notes in PP. 4. Summarize how have artists made choices in how to show stars? Introduce WebQuest, reading together in the Internet. Hand out worksheets to be filled in while looking at websites. After the search, findings are shared and written on a large chart. Independent Practice: Students spend 15-20 minutes searching the web for images and writing down their observations on the sheet. Closure: Ask them to think back Are the real stars we see here in any way like the ones we saw in the artworks we looked at yesterday? What ways? What kinds of colors did you see? What kinds of shapes? Guided Practice: Demo of painting techniques, color wheels and value charts: Wet brush, dry brush, how to keep a point on the brush, primary and secondary colors. Have students mix together a secondary color, and then create tints and shades with it on a value chart. Discuss different ways to create shades, and how to mix black and white with color. Independent Practice Create color wheels and value charts using the Xeroxes. Guided Practice: Review and discuss the art and images of stars, focus on the artist choices. How will they choose to show stars in a night sky? Do they want to see some land, or only the sky? Review variety of painting techniques and how they can affect the painting. Plan the painting first by sketching with a pencil, and then begin painting. Independent Practice: Begin painting by planning sketch, then painting. Assessment Method: Verbal review, final art to be graded with a rubric. Guided Practice Go over Artist Statement assignment and graphic organizer, discuss good writing and grading. Independent Practice: Begin Statement by filling in organizer and starting first draft in class due next day. 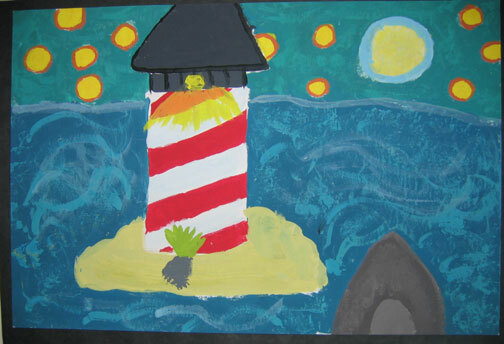 This is a Web Quest for Sixth Grade Art Students. You are an artist who is researching the night sky for inspiration for a painting. After looking at how artists in the past have depicted stars, you are here to collect visual data about actual stars that scientists have gathered in four categories: COLOR, SHAPES, IMAGE, INFORMATION. You must spend some time at both websites below in order to complete your research. Go to each of the websites below, following the instructions for each to find the visuals, in order to make list what you see into the 4 different categories on your sheet. Look at as much as possible on your way through the galaxies! 1. The Stars page at NASA KIDS (Archive) Space & Beyond has many different sections (See the new site). Visit About Stars, What are Stars?, Star Art and the Stars & Nebulae Gallery (No longer online- See the Star images instead) while at this website. 2. 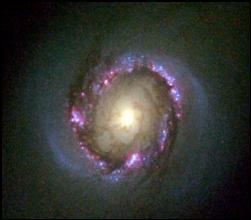 The Hubble Site is a wealth of information about the skies above us. Click on the Gallery to view pictures. In art, you will create a painting of a Nocturne, drawing on the information you gather today and our discussion of art in class. The completed WebQuest worksheet will be evaluated with a rubric (See below). The final project will be evaluated with a rubric in Art. List everything you notice about the stars you see online in the different categories below. Use the back of this sheet if you run out of room.